The issue of the red carpet emerged when it was reported that the red carpet at the Business Woman of the Year Awards ceremony this year (2015) was rolled away. The same happened at the Swaziland Inter Municipal Games Association (SIGA). The Times of Swaziland, the only independent newspaper in the kingdom, reported that the Swazi Police had ordered SIGA to remove the red carpet. Barnabas Dlamini, the Swazi Prime Minister, was at the event to give a speech. According to Swaziland Solidarity Network (SSN) the police had acted on king's orders. But the Royal Swaziland Police denied any such order from anyone let alone from the king. This is the usual tactic they use, ...violate human rights and when the international community expresses discontent about it, the Swazi regime denies responsibility and dismisses the whole act as some light-hearted activity at the discretion of some individual etc... In this case the police spokesperson Superintendent Khulani Mamba pulled the same trick by distancing the police from the BAN of using red carpets during public or private functions. And yet he did confirm the police did order the functions' organisers to roll-up the red carpet... he claimed "...no specific individual instructed the cops to remove the red carpet but was feeling of those who were waiting to welcome him (the prime minister) that such good gesture may be lost in interpretation, hence the decision to remove it". I believe it is and should be the right of every individual to use any rug / carpet / tiles / fabric etc of any colour they prefer and choose without interference from the state or government. I strongly object to King Mswati III and his cohorts to his meddling with citizen's fundamental rights to use commodities as they wish. I do not accept that the monarchy holds a proprietary right and access to certain colours and to certain coloured rugs... its a basic human right to clothe and adorn oneself as it suits within the golden rules of not hurting anyone else in the process. 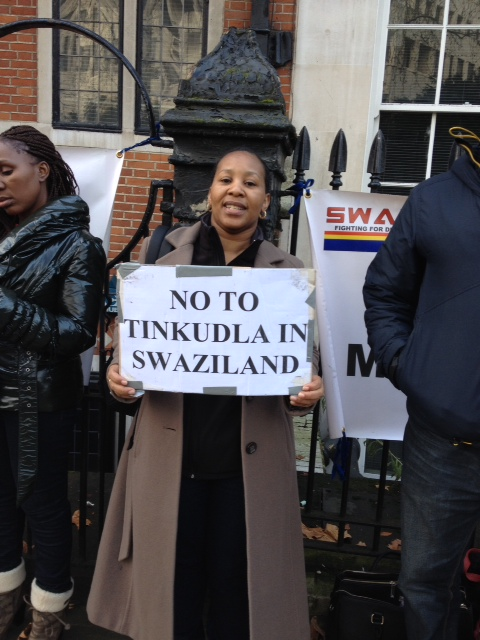 As part of the Swazi Vigil UK protest group, I call upon the king to come to his senses and realise the stupidity with which he conducts himself and the way he heads the country... Phansi ngaMswati Phansi!!! The king's unwise behaviour in running the country has caught the eyes of the international community as quoted by the American Embassy in Swaziland's cable to Washington which stated that King Mswati was "...not intellectually well developed..., was not a reader..., was imbalanced..., has a lack of wisdom..." etc. This shames us as Swazi people (eMaSwati) when someone who should be holding a high esteemed position in our country is seen to be any of these descriptions, not because they are just belittling him, but because of his actions, his behaviour and the way he runs the country like his personal farm... speaking of which Swaziland in many ways is his farm since the 1973 King's Proclamation gives him the sole ownership of the country and all state owned real-estate. That is the very reason I stand with our comrades at Swazi Vigil and call for the respect of human rights, freedom of speech, freedom of expression, freedom of thought, freedom of conscience, freedom of religion etc in Swaziland. We will continue to fight until there is Full Democracy in Swaziland... Phambili Swazi Vigil, Phambili!!! Swazi Media, PETTINESS OF THE KING'S RED CARPET, Richard Rooney, 2 December 2015 http://swazimedia.blogspot.co.uk/2015/12/pettiness-of-kings-red-carpet.html; Date Accessed: 05-12-2015. Facebook, Save Amos Mbedzi-Release All Political Prisoners (SWAZILAND), Lucky Lukhele, 24 November 2015, https://www.facebook.com/www.ssnonline.net/posts/613015975505639; Date Accessed: 05-12-2015. Bemanti held hostage a businesswoman, daughter and a maid. Who do these men think they are? 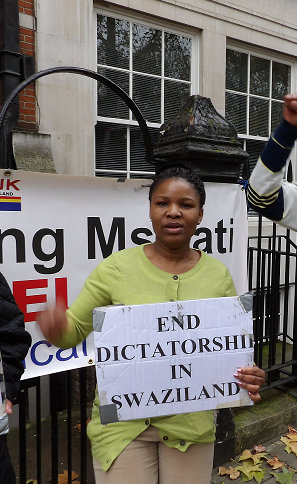 Swaziland is going all over the world, lying about human rights being respected in Swaziland. How on earth is this barbaric act of these irresponsible and nasty guys allowed to continue? These guys unfortunately, are mostly in the armed forces, including the police, prison wardens and the army. Another incident happened in Pigg's Peak, the same area of the above incident. The same group, known as "bemanti", snatched a poor baby from its mother, just because she was not caring him on her back using "imbeleko" - a baby carrier kit. These monsters have been released by the king to terrorise the voiceless Swazis. Both the mother and the baby were left traumatised by the incident. These man normally go for days without washing up, and then end up stinking. Imagine your baby being grabbed by a stinking group of strangers. This will be a scare which will never heal for the poor baby. Unfortunately, the poor woman called the police after the incident, who just laughed it off, and never took it seriously. 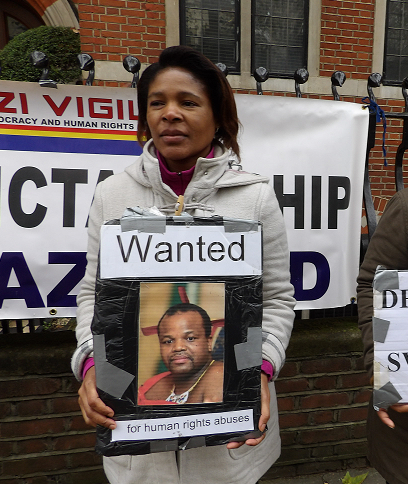 Where are the human rights in Swaziland? Women in Swaziland are taken for granted. We need to stand up and fight for our rights as human beings. The country will never exist without us women. The Queen is quiet, as all these inhumane incidents are happening. There are women in parliament, but none are challenging such barbaric acts. Is it because they're part of the government which doesn't respect human rights? These are the despicable acts supported by our government. This has to stop! Times of Swaziland, BEMANTI HELD MY FAMILY HOSTAGE FOR AN HOUR - BUSINESSWOMAN, Joseph Zulu, 23rd November 2015, http://www.times.co.sz/news/105680-bemanti-held-my-family-hostage-for-an-hour-%E2%80%93-businesswoman.html, Date Accessed: 01-12-2015. NO FREEDOM OF SPEECH IN SWAZILAND! People in Swaziland have been ordered not to comment on the controversial sponsorship of a new soccer tournament because King Mswati III has "pronounced" on the subject. In a stark example of the lack of freedom of speech in the tiny kingdom where King Mswati rules as sub-Saharan Africa’s last absolute monarch, the most senior monarchy loyalist TV Mtetwa has pronounced that ‘members of parliament, [cabinet] ministers and whoever’ must be silent on the matter. The controversy surrounds the E9 million (about US$900,000) sponsorship of the Ingwenyama Cup tournament by the government parastatal Sincephetelo Motor Vehicle Accident Fund (SMVAF). SMVAF exists to compensate victims of road accidents. A range of critics said the amount of sponsorship was too much to spend in a kingdom that was presently battling with poverty and a drought. Seven in ten of the King’s 1.3 million subjects live in abject poverty with incomes of less than US$2 a day. But, the Swazi Observer on Saturday, a newspaper in effect owned by King Mswati, reported on Saturday (21 November 2015) that Mtetwa, who is generally regarded as the ‘traditional prime minister’, said people must stop discussing the topic, ‘because the lion has already roared on the matter' - meaning the king has spoken, and that's final. The newspaper added, ‘Also sought for comment, was traditionalist and National Court President Ndumiso Dlamini who put it clear that he expected no one to taint what the king had blessed’. 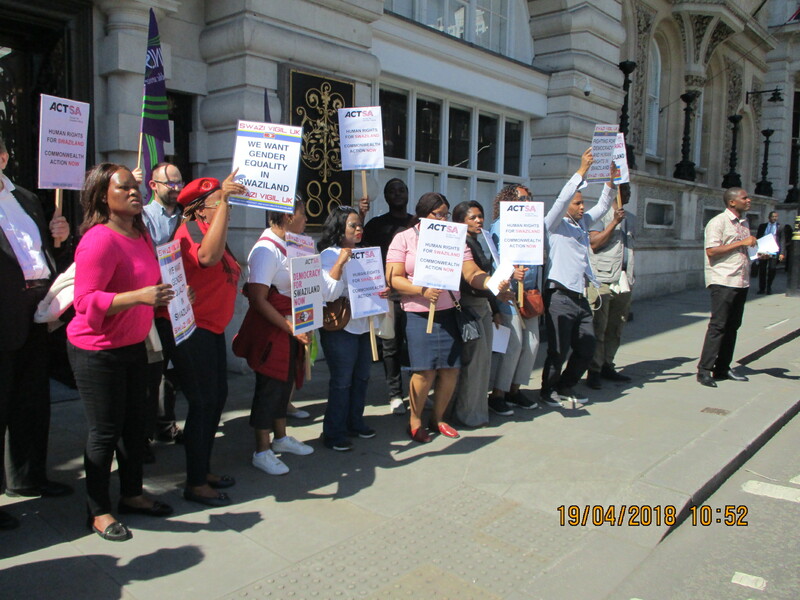 As Swaziland Vigil UK, we will continue fighting against such traditions and practices because these are the very core violations of human rights the Swazi regime exercises without even the possibility of being challenged. We continue to FIGHT FOR DEMOCRACY IN SWAZILAND, FREEDOM OF SPEECH, HUMAN RIGHTS AND ALSO WOMEN's RIGHTS until the whole world hears us. What Could Swaziland Possibly Benefit From A Russian Alliance?